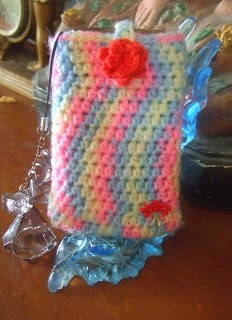 This pattern is for Samsung Galaxy Y Duos. But can easily be adjusted to the size of your cp. Button (I used a 3 layered flower made of #8 100% cotton yarn instead of a button here). 1 sc into 2nd ch from hk and into each of the next 9sts, 3 sc into the last ch. Working into the unused stitches, 1sc into the first ch and into the next 9sts, 3 sc into the last ch. Join with sl to 1st sc. Do not join the last round. Sl in each stitch around. Join yarn at center of the back side of the case. Chain 20-25. Sc into 11th ch from hook. Sl st to1st ch. Fasten off. Sew the button at the front side of the case.